Wait… again. 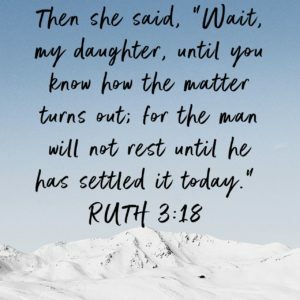 Ruth and Naomi have been waiting, but now they are waiting again. They waited and they saw several things happen all of a sudden. Now they are back to waiting. Read Ruth 3:16-18. Boaz has already indicated that he has a plan and now, they have to wait for him to follow through. This reminds me of when I have brought situations to God and I know that He has a plan to address them, but then I try to “help” God out with his plan. Ruth and Naomi didn’t try any of that. They waited. They allowed Boaz to work, just like we are to allow God to work His plan in our situations. Will we rest in God and allow him to do what he has promised?